The French press is a practical brewing device. In this post we’ll take a closer look at how to use it like a real barista and also reveal some of our favorite models. When you’re a true coffee geek, you’re always on the lookout for new ways to experience the bean. The French press is a deceptively low-tech brewing method. It’s actually not that easy to make a truly outstanding cup of coffee from this device. Still, there is a good reason it’s a favorite among many coffee snobs. And if you’re the kind of person who likes your coffee to be strong and “black as midnight on a moonless night,” you are likely to fall in love with this kind of coffee. The Espro Press is the most advanced French press currently on the market. The filter is capable of producing a ‘cleaner’ and smoother cup than any of the traditional models. It keeps your coffee hot from morning to at least early afternoon, and then it looks pretty cool, too. The caffeine force is strong in this one. What to Look For in a French Press? Generally speaking look for models made of metal or glass. With the latter, go for a brand where it’s easy to find a replacement carafe if an accident should happen. Trust me – they do! Ensure that the plunger has a tight seal and that the mesh filter is relatively finely woven. This is where the cheaper models often fail and use flimsy materials. Of course, this is up to each person, but I think you should have aesthetics in mind too. After all, you’re likely to spend many mornings with your French press, so you might as well pick one that looks great. It’s pretty easy to press a good cup once you know what you’re doing. But if you just follow the regular Joe Sixpack recipe, you’re likely to end up with an average cup. With the old school method, you prepare your coffee, which has been coarsely ground, with hot water, and then press the plunger down to trap the grounds at the bottom after a 4 minute steep. However, this kind of coffee is very often under-extracted. There is a way around this, which relies on technique, patience, and precision. 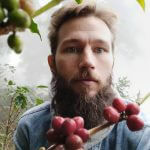 It’s the English coffee guru James Hoffmann who has invented this style of brewing, and it takes its influence from a traditional coffee cupping. First, measure and grind the preferred amount of coffee. I recommend 65-70 grams per liter of water. Pour your hot, filtered water carefully over the grounds at the bottom of your French press and wait four minutes. Do not put the lid on just yet. Next, stir the crust formed at the top of the water and use a spoon to lift off any large bits that remain. Now, you wait for five to six minutes. This period permits plenty of time for gravity to draw all the suspended coffee to the bottom. At this point, you’re ready to pour. Don’t plunge! Just fit the lid over the top of your carafe and use the plunger filter to strain out any errant grounds. The result of this method is a better tasting, cleaner cup of coffee, which is definitely worth the wait. They’ve made improvements over the years, including introducing a safety lid that seals to prevent inadvertent catastrophes involving spilled coffee and dishwasher-safe materials to make cleaning easy. Plus, the glass component is crafted with a high level of borosilicate, which slows the rate at which the glorious beverage cools. The rest of the press is crafted from a nice and premium-feeling stainless steel. This classic is enduring for a reason— high-quality construction and design. For an idle Sunday breakfast or an afternoon boost, both the image and the actuality are ideal. No, it won’t scale mountains with you, but it will do exactly what it was designed to do in the context of home or office. When it comes to stainless steel, there are better options and less desirable models. This one tops all of them. First, you’ll remember our consideration of materials. Stainless steel is both durable and won’t react with the acids present in coffee beans. This means every cup you enjoy will taste just as intended. Second, it’s durable and will stand up to most trials of home and office use, while still retaining its good looks. Third, this model is designed with a double wall to provide superior insulation and keep your coffee hot. It also uses a revolutionary double filter with micromesh and a rubber lip to ensure that each cup you pour is free of particulates large or small. It stays hot far longer than its glass counterparts, delivers consistently delicious coffee, and the patented filter system is free of BPS, BPA, and phthalates—none of which you want in your brew. The only slightly negative thing I can say about this device is that contrary to most other French presses doesn’t go well with the Hoffmann-method. I love my French press, but I also adore good coffee on the road. Since not every press will appreciate being exposed to backpack travel and hard use on the trail, I have to admire those that do. This model from Secura is ideal for some reasons. It has a 3-screen filter that does a great job of keeping grounds out of the cup. Plus, in addition to having a larger capacity, it’s easy to disassemble and clean by hand (even though it’s dishwasher safe.) It also has a cool-touch handle and knob to ensure you won’t burn your fingers around the campfire or in the office. Cold brew coffee is relatively new as far as social trends go. However, Bodum has the perfect way to create this tasty variant at home or in the office. With a unique locking lid, it keeps spills from being an issue and also functions to prevent strange flavors from invading your coffee if you brew it in the fridge overnight. A 50-ounce capacity also means that this is an ideal French press for cold brew. The Bodum Bean also looks pretty damn cute. I can see this get a lot of likes on Instagram. In case you wondered; yes this brewer is made of BPA-free plastic. 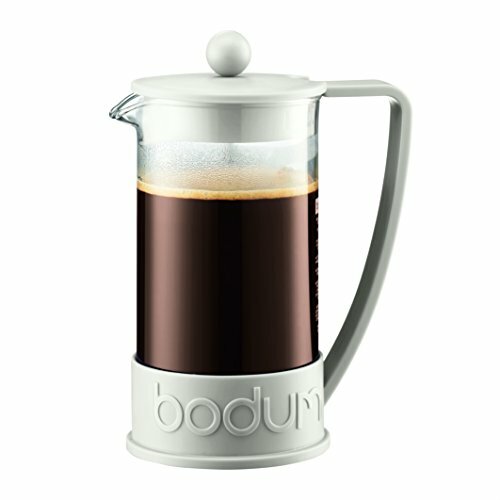 When it comes to making large amounts of delicious, French pressed coffee, Bodum got you covered. 51 ounces of fresh, steaming deliciousness should not be left to the caprices of amateurs but trusted with a company that has provided decades of consistent excellence. 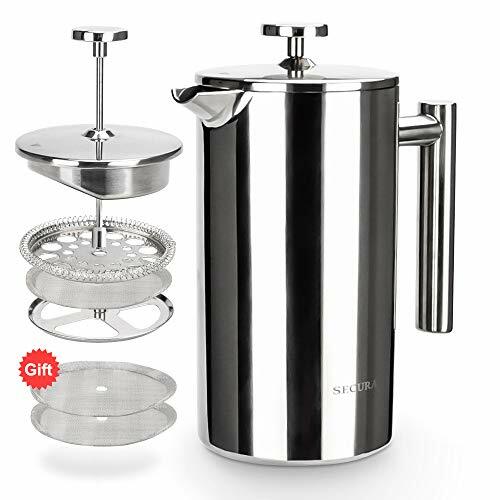 The borosilicate glass carafe is lightweight and resists heat loss, and the stainless steel plunger does an admirable job of confining the coffee grounds to the base of the press. The lid prevents splashing during pressing and spills before and afterward. It has a polypropylene handle and base to ensure safe handling and reduce heat transfer to surfaces, which can potentially damage them. 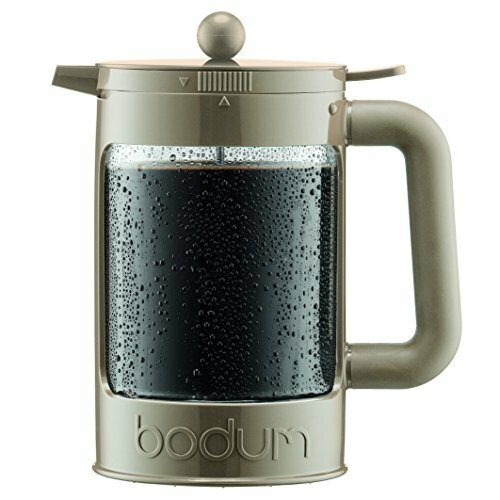 Bodum has successfully translated all that is good about its smaller press into a larger version, ideal for sharing. Or not. While my heart will forever be given to Bodum, as any son or daughter of Denmark should, I can’t give them the honor and title of ‘Best French press on Amazon’. They make excellent, consistent, and beautiful products. However, the Espro Press has a slight edge. The dual micromesh screen and patented gasket provide a superior 4-minute cup of coffee in comparison to the competition. That being said, each of the other four entrants in this list offers excellent value for the money. 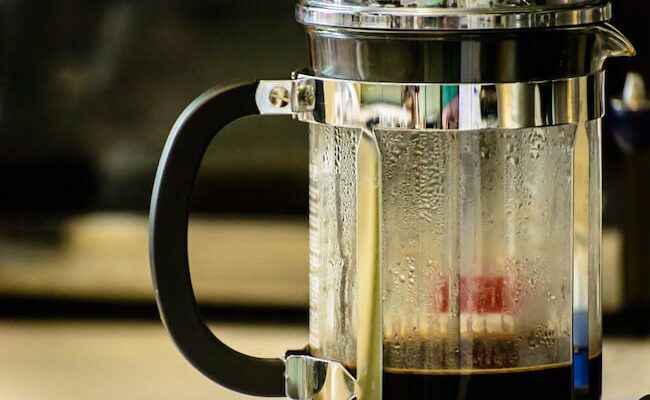 Plus, when using James Hoffmann’s French press method, the other, more traditional models are better because the technique renders the need for the extra filtration mechanisms moot. 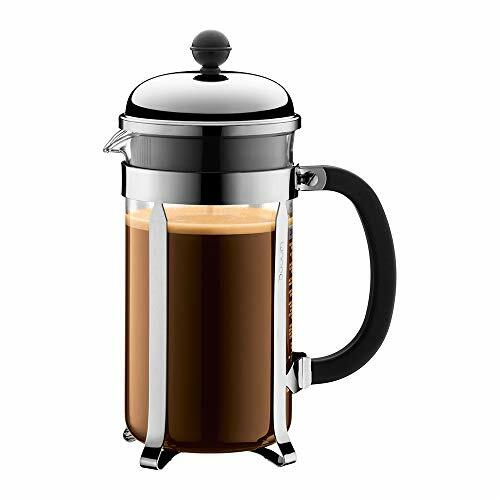 Among the best French press coffee makers, you’ll find models of two materials—glass or stainless steel. Now, each has its benefits and drawbacks. Glass is the classic material, mostly because it’s clear, historically less expensive to manufacture, and does a fair job of preventing too much heat conduction, and it’s easy to clean. Considering the alternatives when the French press was first designed, we all know that glass is the obvious go-to. But today, stainless steel models provide many of the same benefits that glass historically offered. It’s lightweight, durable, relatively good at keeping beverages hot for a time, and also not as expensive to manufacture as some other materials. While they haven’t figured out how to make transparent steel just yet, it does offer one point that glass does not—it’s virtually indestructible. The answer to this query may vary for a single model, depending on where I want to use the press. For example, if I want a new one for my home kitchen, I’m more likely to favor glass models. The design can be less practical if it’s going to sit on a counter rather than travel into the wilderness. 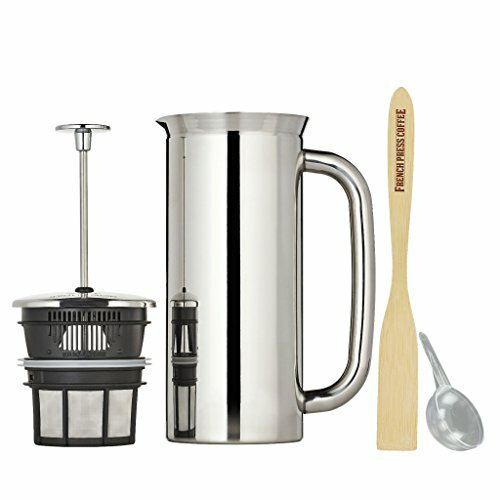 When purchasing your first French press, apply the considerations most important to where you’ll be using it. A beautiful double-walled glass model is tempting, but will it survive a camping trip? Ordinarily, I’d spend the entire section talking about mesh types for the filter. This is still important since you don’t want a model that uses metal subject to denaturing in close contact with natural acids in coffee. But there are other technologies available now, that function in lieu of a mesh filter. For example, the Espro Press allows you use a paper filter in conjunction with their mesh filter to get that ultra-clean pour over style cup. How cool is that? There’s also the Hoffmann technique – a way of brewing that people in the world of coffee are getting increasingly fond of – that makes the filter less critical.